First, I would like to thank you for your prayers and for all the work that went into ensuring the interview process was smooth and positive for all involved. I enjoyed the many conversations I had with members of the congregation, PCC and ministry team, and I greatly appreciated your friendliness and hospitality. When I was offered the post, I was amazed and excited, and the news is still sinking in! I applied for the job because I sensed in your profile that there was a strong overlap with my approach to faith and ministry, and this was confirmed during my visit: I was struck by the balance between tradition and friendliness in your worship, your open and inquisitive approach to the Christian faith, your passion for social justice, and the strong sense of community that binds you together as a church family. I am greatly looking forward to joining that family and working with you all as we discern where God is leading us in this next chapter of Holy Trinity’s life. Once I am in post I will get to know you all in person (no doubt over a cup of tea! ), but in the meantime, here is a bit of information about me. For the past three years I have been based in Kidlington, Oxford, as curate in the parish of Kidlington with Hampton Poyle. This has provided me with extensive experience in a team ministry setting, in a busy and lively parish. Two big highlights of my curacy have been helping to set up the Kidlington Community Hub at St John’s (running groups that used to meet in the local Children’s Centre), and developing a teaching ministry through delivering a year-long series of talks, Theology through the church year (http://www.parishofkidlington.org.uk/clergy/feas_series.htm). I am also a vocations advisor in Oxford Deanery, accompanying candidates who are exploring God’s call on their life. I am passionate about Christian education across all age groups, and I believe strongly that parish churches should be places of welcome, hospitality and inclusion. I studied Philosophy as an undergraduate, at Queens’ College, Cambridge and at Harvard on a Kennedy Scholarship. Prior to ordination, I worked as an academic philosopher—at Cambridge University, Georgetown University, the University of Virginia and the University of Kent. My research focused on the intersection between Philosophy and Public Policy (in particular, taxation and intellectual property rights), and I had some exciting opportunities to communicate philosophical ideas beyond the academy—to secondary school children, trainee doctors, business leaders, digital artists, MPs and policymakers, including a placement at Presidential Commission for the Study of Bioethical Issues in Washington DC. My spiritual roots are varied. I was baptized in a Methodist church as a baby, and then moved to rural Kent aged 11, where I stumbled across a Nicky Gumbel booklet in a local Anglican church. This convinced me that I wanted to make Christianity the foundation of my life, and I was confirmed a year later in Canterbury Cathedral. I discovered my vocation to ordained ministry whilst completing a Philosophy PhD at St John’s College in Cambridge, where I was nurtured by the Anglo-Catholic worship and open and intelligent approach to faith. Over a period of six years I trained for ministry in three different settings—Westcott House, Cambridge, Virginia Theological Seminary and St Augustine’s College, Kent—alongside my full-time work as an academic. 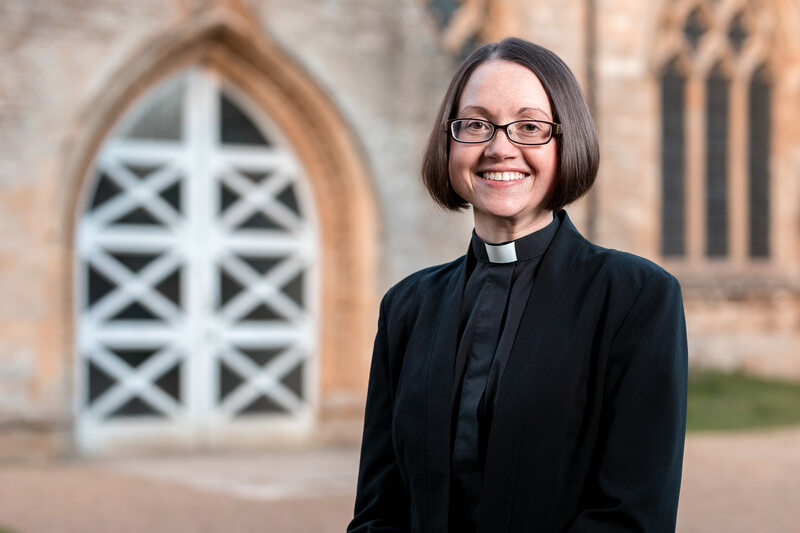 I gradually felt that God was calling me to full-time parish ministry, and so I left my permanent job as a University Lecturer in order to take up my appointment in Kidlington. I haven’t really looked back since! I am a keen musician, playing clarinet, saxophone and piano, and it was through music that I met my husband, Dominic Scott, who is a Philosophy Professor at Oxford University, specialising in Ancient Greek Philosophy. Dominic and I met through playing together in a “philosophers’ concert” that was organised when we were both at Cambridge. (It didn’t involve Monty Python). We have been married for almost nine years, and we have a wonderful six-year-old daughter, Zoë. We are really looking forward to putting down roots in Headington. I will be praying for you all over the next few months, and I am especially grateful to the churchwardens and ministry team who are working hard to keep things running so well during this period of vacancy. In the spirit of Advent, I wait with joyful anticipation to be installed as your new vicar in June 2019.